Make a plan with your people. Set up your meet up. First, make an emergency plan with your inner circle of friends, relatives, or immediate family. That way, you will each know what to do in an emergency. What basics does your plan need to include? Select a few of your nearest and dearest. Who’s the group you’ll want to get in touch with if something happens? Pick an out of state contact. Who can serve as a hub for information, if you can’t reach others in your local area? Agree on a place to meet. How about a park? A landmark? Don’t choose a house—in case it’s inaccessible. 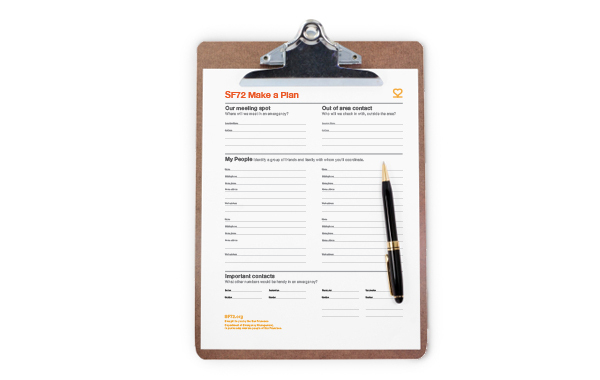 Use the simple forms in this pdf to make a plan with a few people close to you, so you all know what to do in the event of an emergency. Print a copy for yourself, and email or print copies for the people in your group. Stick your copy on the fridge—or somewhere else you won’t forget. Print our Quake Guide to learn a few easy steps to keep your cool when the earth shakes. Duck under a strong table or desk. Cover your head and neck with your arms against an interior wall. Stay away from windows. Keep calm and carry on. Keeping your wits about you will ensure that you make safe choices for yourself and those around you. Shelter in place–whether you’re in a car, in bed, or in a public place. Do not try to run out of the building during strong shaking, hold tight until the shaking stops. If you’re outdoors, steer clear of wires or falling objects. If you leave home, leave a sign telling friends and family your location. Digitally savvy? Send a Tweet or Facebook update telling everyone you know that you’re ok. Listen to the radio for important information and instructions. Remember that aftershocks, which generally follow large quakes, can be large enough to cause damage in their own right. In the event of an emergency, this site will go into emergency mode and bring you live updates and tweets from around the city, information on missing persons, and ways you can help.